With a name such as “Thief”, you’d be forgiven for assuming the look, feel, and design of the slot would be consistent with 1800’s Britain; a time when thievery was rife. Thief – the game from Net Entertainment however – is based in a futuristic society, with a unique blue-looking layout, somewhat reminiscent of a Blade Runner type of environment. While the background and setting appears to be somewhat depressing at first (in part, thanks to the consistent rain, and dull blues used throughout), the game itself is quick to liven up the mood, with an exciting bonus-round, great base-game wins available, and a unique soundtrack that keeps you hooked. 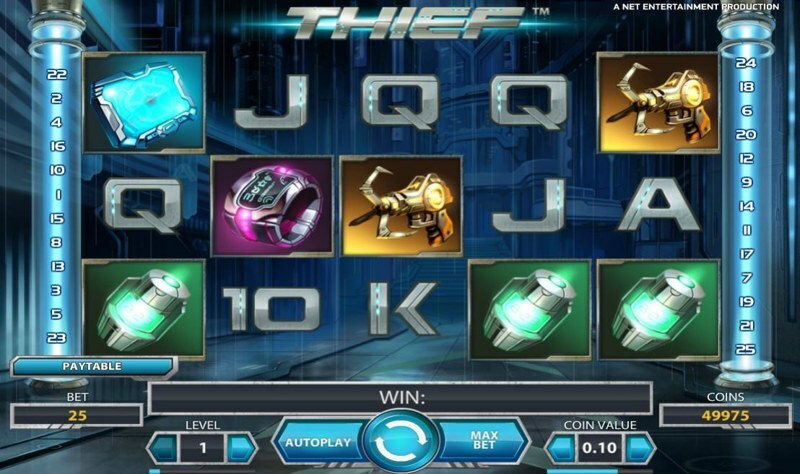 Thief is also designed to be available for mobile players, and Net Entertainment have done everything they can – technology wise – to present players with a mobile-optimized version of the game. Simply open it up from a mobile Internet browser, and you’ll be able to begin playing right away. With 5 reels, 3 rows, and 25 pay lines, the game is similar in physical-design to most Net Entertainment slots, with a few playing-options available. First, you’ll be able to easily adjust the stake (minimum bet is £0.25, with the maximum bet capped at £250) thanks to the “Level”, and “Coin Value” buttons, which gives you the power to customize the slot’s stake to your preferred level. There’s also an AutoPlay function, which allows you to set a pre-determined number of spins to auto-spin, removing the need to manually click for each spin to begin. You can set the AutoPlay feature to 100 spins in total, and you can set loss-limits, win-limits, and much more. On the reels, you’ll see a selection of playing-card symbols, which are of course, the low-paying symbols, and you’ll also see game specific symbols (which pay a lot better than the playing cards! ), and these feature a Pistol, a set of Headgear, Explosive Devices, a Thief’s Wristwatch, and a Diamond symbol. The Wild Symbol is a special symbol, as it can expand, and there’s also a regular scatter symbol, as well as an Adrenaline scatter symbol; more on that later. During both the regular base-game, and the bonus-round, you’ll be able to benefit from the expanding wilds, and these wild symbols appear on the middle three reels only. While the wild symbols are initially sized normally, filling one symbol slot, if the wild symbol is part of an active, winning pay line, it will then expand to cover the entire reel, giving you the chance to add more winning pay lines, thus increasing your win. Land two or three of the expanding wilds, and you’ve got a fantastic chance of making 4-of-a-kind or 5-of-a-kind pay lines, and this equates to big wins. 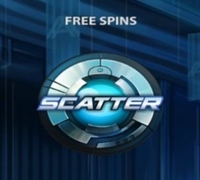 Land three of the regular scatter symbols, and you’ll be awarded with 10 free-spins. If you manage to land three of the Adrenaline scatter symbols, you’ll be awarded 10 Adrenaline free-spins instead. The “normal mode” free-spins are relatively straightforward, and playout in the same way as the Adrenaline Spins, but the Adrenaline free-spins offer a distinct advantage; the number of symbols found on each pay line is greatly reduced, and all the playing card symbols are removed, giving a much higher chance of wins.